At MWC, NEC was showing off two phones that were actually quite useful, not the usual gimmick laden toys. As you can tell by the names, the G’zOne Type-L and Medias W N-05E each do some things most people actually want. Before we dive in to the phones, the first thing shown off at the NEC stand was a bit of mobile advertising software called Gaziru. You are probably familiar with the, “Scan this image with our app for more info” technologies that are all over the market, and that is where Gaziru starts off. The idea is the same, point your camera at an image and it identifies something in the target and brings you to a web page. This is pretty old hat by now. Gaziru steps out of the expected by processing pictures, video, and 3D objects in real time. It crunches the data on the handset or remotely via the cloud, and can do both simultaneously for the same object. The exact methodology is selected by the client and baked into the app you downloaded or was pre-installed in your device. Why this tech stands out is that even for pulling objects from a video stream it is image recognition based, and does not use embedded tags. This opens up a lot of doors to what can be targeted for more info, the subject doesn’t have to cooperate for Gaziru to work. The whole cloud processing approach has some advantages, especially for performance per watt on some of the more complex problems like video recognition in realtime. The tech is available for iOS and Android, and can be twiddled to meet the customer’s requirements before it is packaged up for the end user. Gaziru is currently live in Japan and has several customers using it at the moment. It looks to me like a real, “next generation” platform, the local/remote split and untagged video recognition capabilities both have a lot of merit. When you first see the G’zOne Type-L phone, you think something along the lines of, “cheap anime fanboi toy”. Luckily for it, name aside, it is a really serious device. The styling is actually somewhat functional, the thick rubber cladding is not just for show, the Type-L is waterproof, dustproof, and MIL-STD-810G shock resistant so the device is quite rugged. The reason for this is because it is an outdoor lifestyle oriented phone with the features to match, not just camo paint and a B-grade celebrity endorsement. In addition to the ruggedness, the G’zOne has temperature, pressure, gyroscopic, acceleration, and compass/magnetic sensors on board so it is actually useful out in the middle of nowhere. There are also bundled mapping and sensor apps to use these abilities with, an often overlooked thing in similar devices. 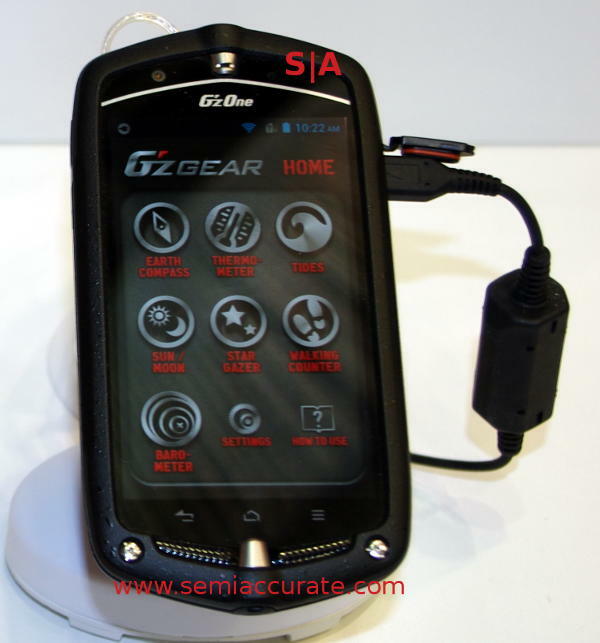 From there the G’zOne Type-L is a pretty ordinary Android 4.0 phone. It has a Qualcomm MSM8960 SoC at 1.5GHz, 1GB of RAM, 8GB of flash, and an 1800mAh battery. The rear camera is 8.1MP and the front is 1.4MP, pretty standard for a recent phone. The only other nifty feature is a bluetooth link to a G-Shock watch, handy for the rugged outdoors type who is too lazy to reach for his phone. 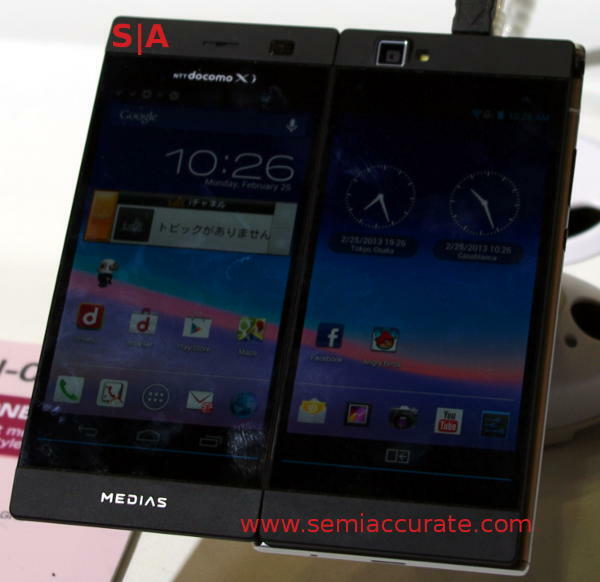 Changing direction entirely we come to the Medias W N-05E folding tablet/dual screen phone. It mainly looks like one of those over-sized phones that are so common of late, but it has screens on both sides of the device. It folds out from a 4.3″ screen, two technically, to form a single 5.6″ nearly square tablet. If each screen is 16*9, two would be 16*18 or so, a much more usable aspect ratio for doing real work. Other than folding out to a tablet, this phone has pretty standard hardware too. The Qualcomm MSM8960 at 1.5GHz is the same as the G’zOne as is the 8.1MP camera, no “front facing” camera, that idea is mostly irrelevant in this form factor. The battery is a generous 2100mAh hours, it needs to be if you have two screens running at once. This phone seems to embody a very useful idea, a pocketable folding tablet.